As my three weeks here at Esalen come to a close, I find myself extremely grateful for the support teams who have shown up here and made my three classes of teaching flow with grace and ease. For Healing the Pelvic Floor, I am deeply grateful to Chery Owens, Heather Hannam, Lori Chinitz, Sharon Sherman and Robin Burnside who seem to effortlessly hold the container for such deep healing to occur. For Full Body Presence the team that held me and the healing work so beautifully was Ed Savay, Richard Griffin and Tim Davis (Yes, an all male team and it was wonderful! )And, this week in SomatoEmotional Release I, the team is Eric Moya, Dianna McAdams, Larissa Ettore, Aurore Sibley and Jeannine Brema. They have been phenomenal – tirelessly stepping up and diving in with the students. Then this morning, my good friend and colleague Joel Ying sent me the following piece on how geese fly in formation. It is exactly what my learning has been about this summer here at Esalen, as I have taught three courses in a row with only minimal time off in between. I simply could not have done it without these wonderful teams of people who allowed me to drop back in the formation and rest from time to time as they picked up the lead role and carried it. That is what good team work is all about and each and every person on these teams did this and I want to acknowledge them here. 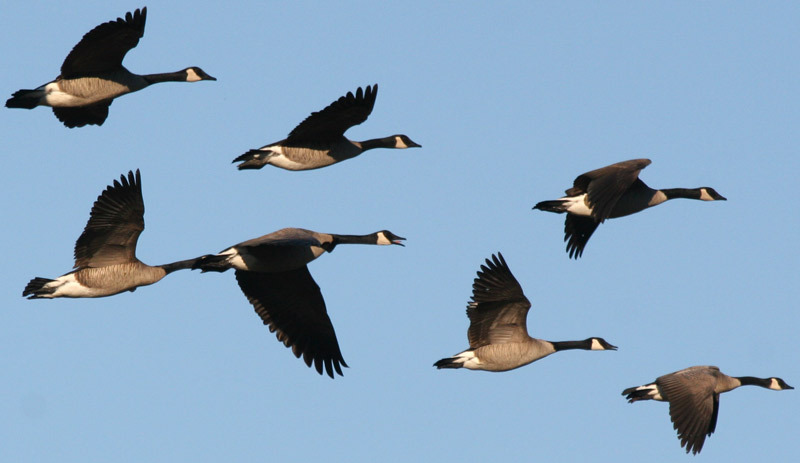 As each goose flaps its wings, it creates an “uplift” for the bird following. By flying in a “V” formation, the whole flock adds 71% more flying range than if each bird flew alone. Whenever a goose falls out of formation, it suddenly feels the drag and resistance of trying to flying alone, and quickly gets back into formation to take advantage of the “lifting power” of the bird immediately in front. When the lead goose gets tired, it rotates back into the formation and another goose flies to the point position. When a goose gets sick, wounded or shot down, two geese drop out of formation and follow their fellow member down to help provide protection. They stay with this member of the flock until he or she is either able to fly again or dies. Then they launch out on their own, with another formation, or catch up with their own flock. Are you letting those around you support you fully? Are you stepping up and fully participating in the communities where you live and work? Are you flying in formation or struggling with the drag of the wind as you try to fly solo? More on these questions to follow. I would love to hear from you on how this issue shows up in your life.